The well-known multiple clouds manager MultCloud has been updated to 4.2. We reviewed its 3.8 and earlier versions MultCloud 3.6 and MultCloud 3.0 before. Since 4.0 of MultCloud, its functions changed a lot. Now let’s see what changes it has. What’s New in MultCloud 4.2? MultCloud supported clouds are 28 now, the new added three are OneDrive for Business, Dropbox for Business and Egnyte. 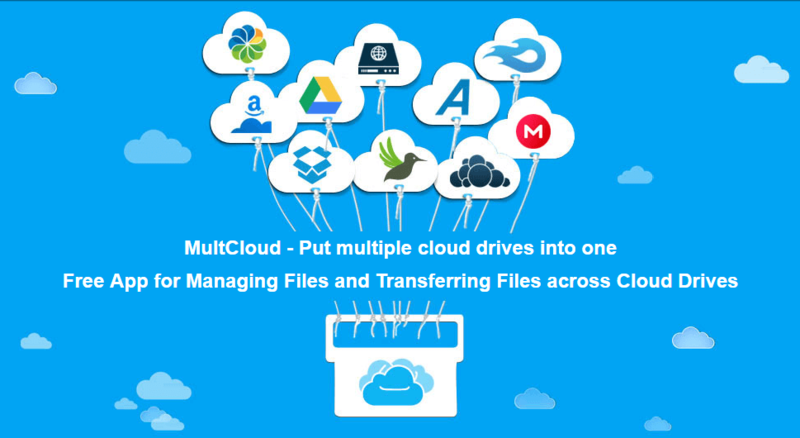 MultCloud – Free web app for transferring files across cloud drives. You can put all cloud storage drive into MultCloud, and it will help you manage your clouds easily. As we know, the key feature of MultCloud is transferring files across cloud services. But it’s far from enough so that MultCloud added Synchronization function to enrich itself. Like Cloud Transfer, there is a Cloud Sync interface. MultCloud Cloud Sync Function – Sync Google Drive with Dropbox, or sync folders between two clouds. MultCloud provides eight sync ways in total: simple sync, mirror sync, move sync, cumulative sync, update sync, incremental backup sync, full backup sync and two-way sync. Default is one-way sync, you can click the arrow to switch to two-way sync. From dropdown menu you can select more other ways. Options and Schedule settings are the same as Transfer. For more details, see the tutorial on sync cloud drive. You can transfer 10TB files across clouds with MultCloud for free. Now it’s possible to earn more free data traffic with MultCloud Points. MultCloud added points system, 1 Point = 10GB traffic. You can get points with three ways: Share MultCloud to SNS (10 points), recommend other people to register MultCloud (10 points), use MultCloud Share to share your files (2 points). Thus, MultCloud equals to give you unlimited traffic for free. In 4.2 version, MultCloud has been added German and traditional Chinese languages. Another change is its Share function, which allows you to upload & new folder actions in share page. I tried and think it is very useful for a group of people. First, create a shared link of the folder. Either public or private link is OK.
Second, enter in Share manager, make the shared folder “Allow to upload” enable. Third, open the shared link, in the share page and enter in the folder. Then you can create new folder and upload files into this folder. If you are a teacher, you can ask your students upload homework in this way. If you are a leader, you can ask your staff upload project data to here. All these files will be saved in your cloud drive too. So make sure that there is enough space in your cloud drive. Other improvements in MultCloud 4.2 are added history-error view feature and added manual retry button when transfer fails. In our last MultCloud 3.8 review, we mentioned MultCloud’s chrome extension can be used as Task Manager. In fact, in MultCloud’s body Task Manager, you can do more things. Make the normal task to schedule task. Re-edit options. Delete the task. View logs and properties. Commit the task again and again. Upload files via download URL. MultCloud is powerful! It is a web app, so easy to access that I used it very often. It solves us lots of trouble when managing several cloud services. The idea – put multiple cloud drives into one is great. Transfer and sync between cloud drives directly saves us lots of time. We wish MultCloud gives us more surprises in the future.